It's a sad day when friends move away. Unfortunately for my kids, and myself actually, it's not an uncommon occurrence. Some friends from church recently moved away :(. G had a particularly good relationship with the boy his age in that family. He was pretty sad to see Cruz go. He wanted to get the boys his age, from our church group, together for one last lake day. I got all of the lake stuff ready, and even patted myself on the back for remembering, or thinking to get cupcakes! Then, then, I had extra time, which never happens, lets be real! I made up a quick and easy sign, and busted out these map flags super quick. After taking pictures, of course, I brought them to the lake. It is always great to make things special, if you can. I wanted this cute boy to know we appreciate knowing him, and taking a few minutes to dedicate some cupcakes to him hopefully expressed that. These are very, very easy to do, and, they go fast. You need a map you don't mind cutting up, scissors, toothpicks and a glue stick. The photo below is an illustration of how to cut your paper. However big or small you choose to make your cake topper flag you just need to make sure you have a crease, and cut into the crease. I just applied glue to the toothpick as well as the flag and folded the two pieces together. 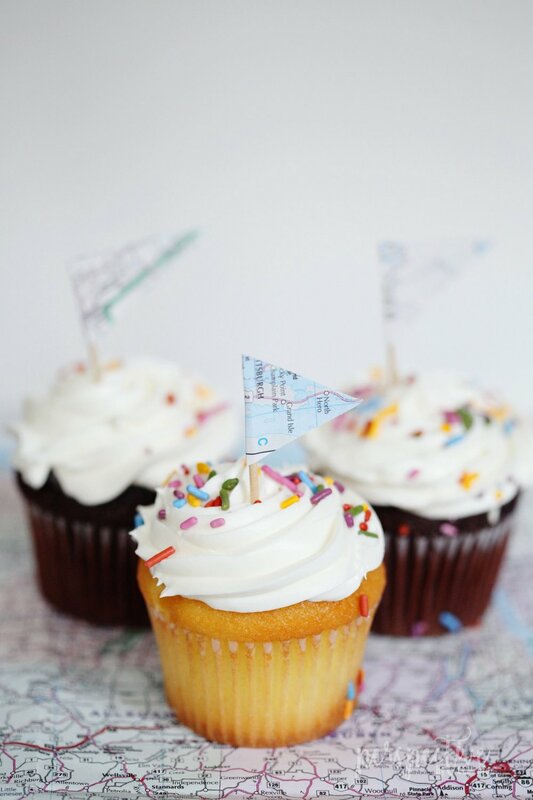 Just poke it into your cupcakes when you are ready! 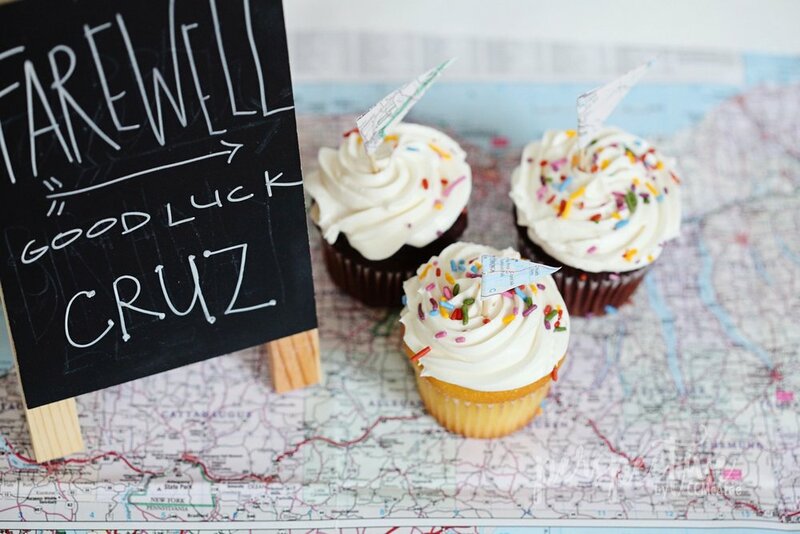 Need a few more ideas for a farewell party? Maybe someone you know is moving, or going on a trip? 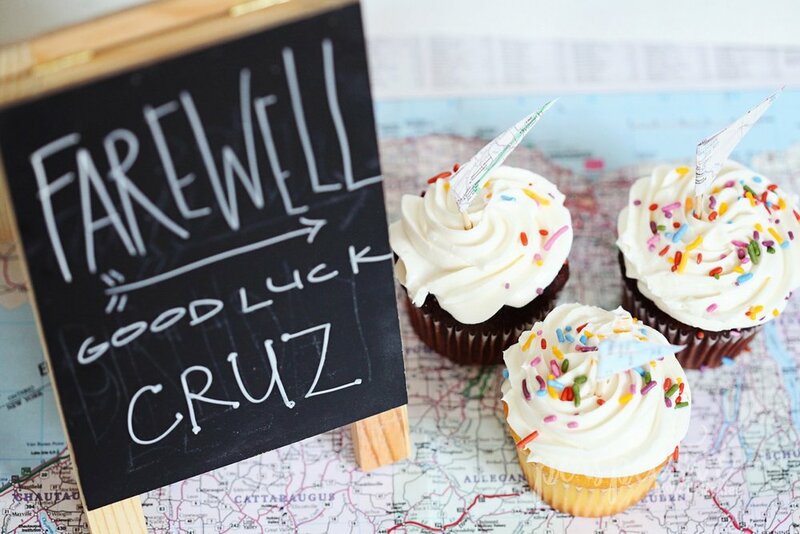 There are a few more ideas in this post: Farewell Party. Save this idea for later! PIN IT!